Second one just quit again after less than 12 months. Second one just quit again after less than 12 months. Not acceptable for the price. Talk about love/hate. When this thing is new and working as it should it was easily my favourite. Unfortunately it just can't go the distance. Cosmetically it will wear out and scratch way faster than you'd expect of an 'adventure/outdoor' watch. That alone I could probably forgive but I'm onto my second watch in under two years now and it's just failed out the exact same way the first one did. While the screen still displays time, all but one of the selection and menu buttons have failed, meaning you can't turn on backlight, can't access the menu, can't change between modes. It is now just a scratched up looking watch with all of its features now locked away by poorly designed buttons that don't last the distance. Unlikely to buy Suunto brand again, which is a shame as they could be great products. Welcome to Trailspace, Same Same. Too bad about this product failing. Have you contacted Suunto to see if they could provide any help? My girlfriend got me the Core deep black for my birthday about a month ago. I am a watch guy and this watch instantly became my favorite. I have used it in Zion and just recently Havasupai in the Grand Canyon. It worked flawlessly! I love the altimeter log function. You do have to calibrate it on occasion but that is easy to do. Digital compass works well too. I have read other reviews about how it is hard to see the display. I think the display is great in nearly all light from bright sun to my headlamp. Backlight works great in a dark tent or in darkness in general. This watch is as stylish as it is sporty. I can wear it with a suit and tie as well as a pair of hiking boots and it looks great. I have received many compliments on it. Great watch!!! I love this thing. If you're looking for an ABC watch and you're tired of Casios, this is what to get. I initially bought a Casio ABC watch and the altimeter was inaccurate the barometer was inaccurate and after looking into the problem on the internet I found out that the feature I was looking for was the altimeter lock. 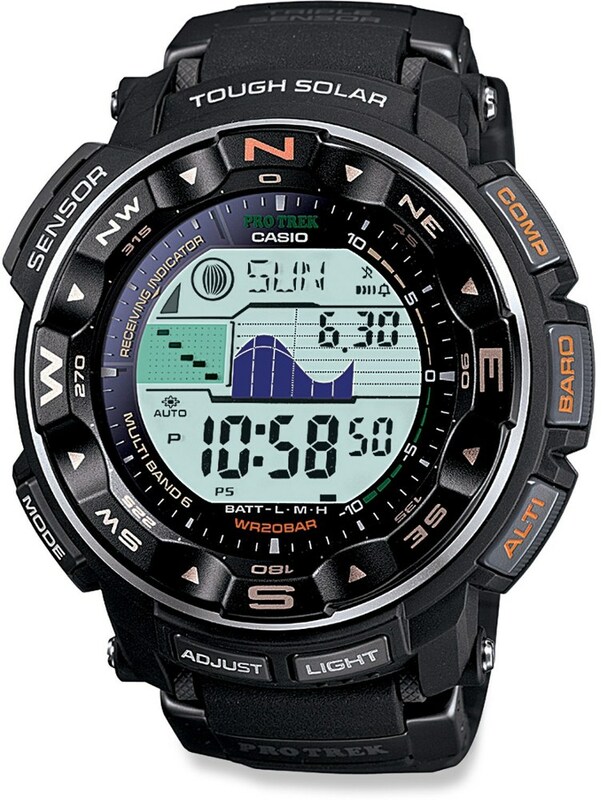 The Casio did have a rugged build and a little better looks, but its function over forum when it comes to a watch like this. It either works or it doesn't...so back went the casio. I use the Suunto all the time hiking and day to day. It keeps logs of my hikes, the rate of the ascent the rate of descent, peak altitude, it's really cool to see how high you've gone and how quickly. The visual graph of it is neat too. I'm still amazed how accurate the altimeter is. The few complaints I have consist of battery life and the waterproof rating. So far after purchasing the watch I've had to change the battery once and that was about six months after I bought it. Most of the reviews I read said that you need to change the battery about once a year, even if it's not dead, just go ahead and change it just in case. We will see if that holds true on this new battery that I have. The other complaint is the waterproof depth ration. I'm actually scared to take in the shower, I'm sure it'll be fine but I'm definitely not going swimming with it, even though it's rated for a 30 feet. I was hoping for something with a little bit better rating like the Casio had, but I'll make do. So far it's been great, it's easy to use (once you read the manual) and looks pretty good. Go get one! I have had my Core for about 6 months now. It is the yellow rimmed one. I like the display, it is not to bright and not to dim and it functions well in the sun and the dark. The wrist strap is very comfortable and feels nice and secure on my wrist. The lense is very strong and scratch resistant, I have beat the watch up bad on Search and Rescue recoveries and there isn't a mark on it. The watch has cool features. The barometer and storm warning alarm are awesome. Especially on overnight trips. I rarely use the altimeter but it seems to work fine when comparing it with my GPS. I love love the compass feature, I would never use it as a primary navigation tool but as a back up or if you have ever been in the situation where you doubt your bearing (night navigating) the quick reference and bearing lock are nice. Also you can set the declination on this watch. The other features are nice, there are too many to list. But the ones I like most are the sunrise/sunset and the count down timer. I would recommend the Core, I see there are reviews that the quality may have been not so great on earlier models but my experience and my friend who has the all black version have been very happy and it seems they have solved the issues, at least we haven't had any. My only complaint is that the yellow rim watch comes in a much more gold metallic colour. I wanted a bright yellow in case I set it down/lost it but the colour is different than what the pic shows. It is still a good colour, just be warned it is different than the website. Purchased this watch brand new on e-bay and about 4 months into it the button to control the stop watch stopped working. I initially thought it was a battery problem because the lights would go dim whenever I used the light function. Replaced the battery and the stop watch button still does not work. I know for sure that the watch was not abused in any way. 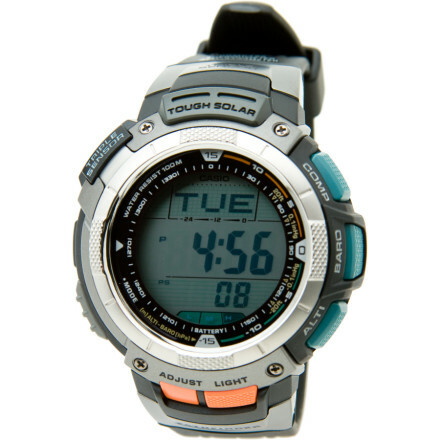 Watch is extremely cumbersome and will constantly unlock itself and begin to move through its own button functions. I'm also disappointed with the customer service because they willnot cover my watch. Horrible experience at best. Has someone had these same issues before? By far the best functioning, most durable watch I've ever owned. I am a kayak instructor in the summer months and backcountry skier in the winter. I've owned my Core since March of '09 and have worn it daily since. I have never had a malfunction and have not even been able to scratch the face. I was going through a watch a year due to water leaks, scratched faces, or broken wrist bands, but the Core is showing no signs of failing in any of these areas. I love the large display and the watch actually gets lots of compliments both in the field and at the pub afterwards. You do have to enable the locking feature to prevent frequent inadvertant button pushing, but that is easily accomplished. Stainless steel wristband broke at least 5 times in the first couple of months with normal use. Retailer where I bought it kept repairing it but the issue is with the rubber connectors. I tried calling Suunto in Canada and they acted like they didn't know about the problem. Then the faceplate separated and after 40 days I finally got a new watch but not wristband. Terrible customer service and an expensive piece of junk. I finally bought a leather wristband. I will never own another Suunto! I purchased the 2009 version of the Suunto Core All Black in Oct '09. So far I have found this to be a very good item. I have not yet experienced any of the issues experienced by reviewers of the earlier models, so hopefully Suunto have corrected those problems with the earlier version software. It can take a bit to remember where the different functions/menu items are, but after a few goes it seems fairly intuitive. It might be useful to be able to do an initial compass calibration without removing the batteries, however if done properly the first time I guess this should not be required. To date I have been quite impressed with the accuracy of the watch functions when compared to other data sources such as maps, met reports, etc. This even includes the "Auto" option when specific data is not required. I found I could calibrate the auto option in the morning and over an entire day including foot and vehicle travel it would still be accurate to within a few metres at the end of the day (assuming there were not horrendous simultaneous altitude and weather variations). I have found the general watch functions to also be easily accessible and usable. In general, as yet, I would happily recommend this watch. This watch is a rip off, Suunto has sent me three in a year and all have proven within a few months. Oh and while they may claim great customer service I was with out a watch for 4 months of this year. So if you like to buy expensive watches and never get to use them, this for you. I should have read the reviews. The watch looks cool but other than that, not much else positive to say about it. Even the customer service is horrible. My biggest complaint is that the buttons get pushed by accident when I'm wearing it. Definitely can't sleep with it on. When I do, somehow, I'm guessing the buttons get pushed and when I wake up, the watch will either be frozen/locked, screen will be fuzzy or the light will be on and will not turn off. The solution is to take out the battery and reprogram the whole watch. I still wear the watch though because it's expensive and I'm cheap. My goodness don't buy this watch!!!! I have had it for over a year, used it for all sorts of outdoor activities (hiking, sailing) and it has been the single least reliable product I have ever owned. It has been back to the service centre 3 times (about to go again for a 4th! ), it will let you down when you least expect it and, if you are an outdoor person, this is totally unacceptable. 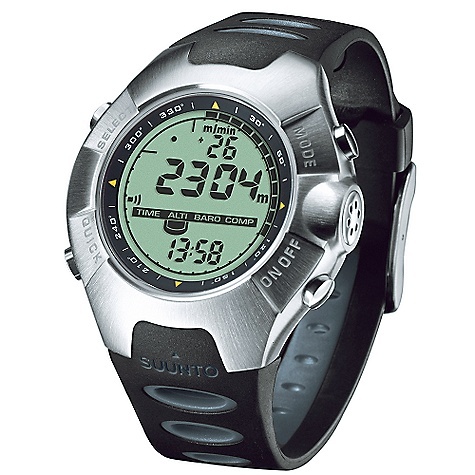 I have used a Suunto dive computer for over 10 years with great results, I can't believe a company with their reputation would put onto the market such a 'crappy' product. I spend a minimum of 14 hours per day outdoors in ever-changing environments. I purchased the "Core Light Black", as I thought that the watch would be durable enough to handle my daily activities, and environments. 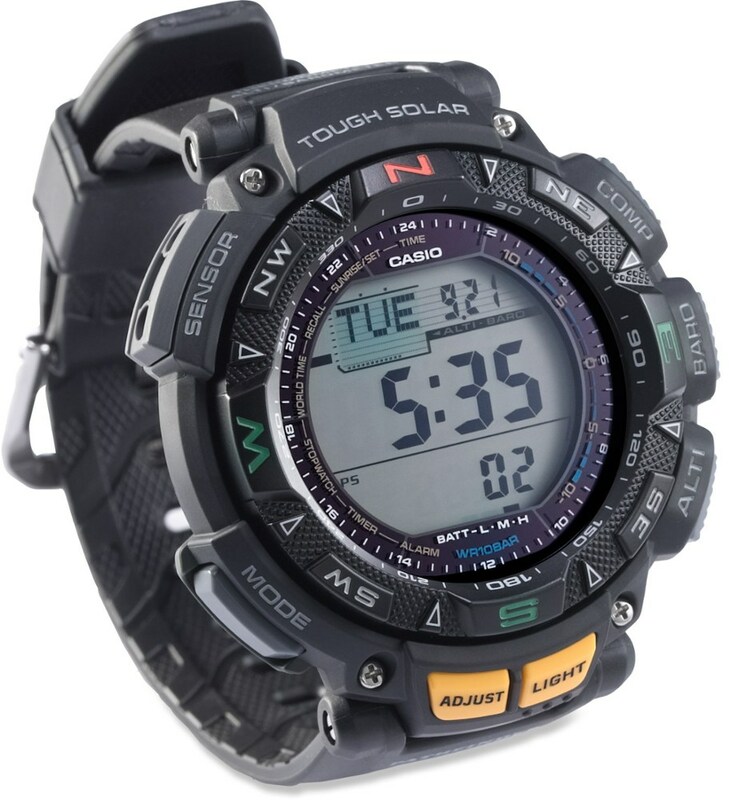 I relied on this watch's functions to assist me with data required to perform tasks. However, after one to two months, its functionality, or lack thereof, became a hindrance. The battery life depleted quickly, which would have been acceptable if I didn't have to recalibrate the barometric pressure and altitude every time it failed. Eventually, (three to four months) the watch was totally dysfunctional, without chime, light, or button operation. I sent it to Suunto, hoping for a quick turn around. Suunto has had my watch for two months and cannot give me a concrete date as to when I will see my replacement. I suggested that they consider a free upgrade to an X10, but of course they discounted that idea and replied that they would do the upgrade for an additional $200. So much for customer satisfaction. On a good note, the Aqualung diving products have worked great... Or do they? Hey, I purchased the Suunto Core All Black Military Edition in Oct 2008. Initially it worked great, we would be out on missions and it never missed a beat....even in this hot Iraqi heat but after a month the batt, went dead. I thought maybe it was a fluke so I purchased 4 cr 2032 batt that it requires to operate and I have gone thru all 4 batteries and its now March 09. Other than that when the batt. are new it works great. I just don't understand why the batt doesn't last in this watch....I even turned all the other features off. If anyone has any insight to this please email me and pass on, I would really appreciate it. I really hope I'm just not stuck with replacing the batt every month in this thing!!! Great look. That's about it. SUUNTO makes great looking sh**ty products. My black/orange core has been sent in for repair or replacement. It is the 2007 version.It would not re-set and the exit button at the top left would not function. The display would go thru random modes and I could not get it to set the time. It was received by the USA service center on Jan. 22, 09, and as of speaking with them today, They are still waiting for someone to get to my watch. So much for a 14 day turnaround. If it requires replacement, It will be sometime in March 2009 before the backordered Cores are due to be delivered. The repair center is very nice and courteous, But I believe they are just overwhelmed with warranty repairs. Probably due to the high failure rate of the Core. I like the Core, But I didn't read enough about it before I took delivery of mine. I read the newer ones are supposed to be better quality wise. Let's all hope that is true. I purchased an 08 model of the light/green version in December and could not be happier. All of the functions work as advertised and it is comfortable to wear especially given its generous size. I changed out the battery when I bought it just to be certain. The large clear face is easy on the eyes. I've read some pretty critical reviews primarily on early editions of the watch, but from what I gather, any serial number starting with an eight (or nine probably by now) seems to be OK. I consider myself hard to please and almost impossibly demanding of high quality in the items I buy (it drives my wife nuts, but hey, I picked her so she should see it as a compliment, right?) and this watch has that in spades. 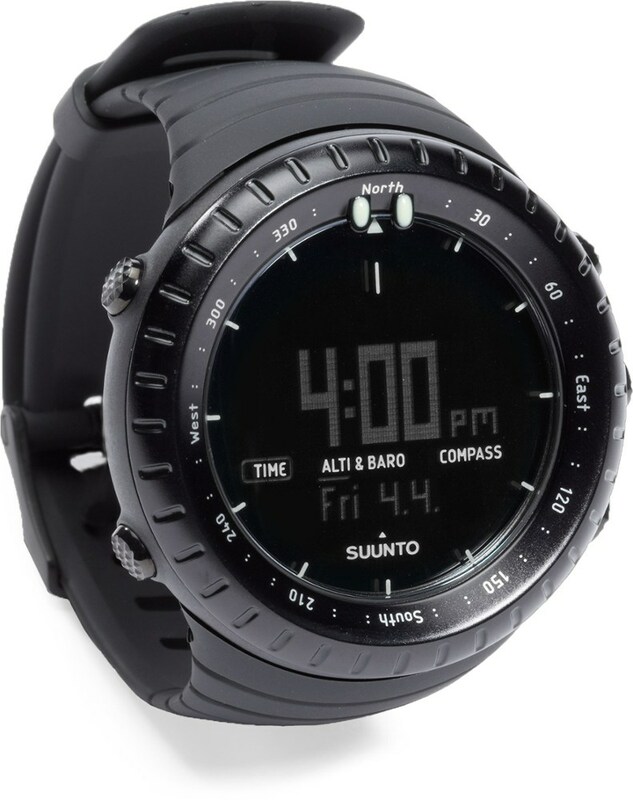 I first want to say that the All Black Core is the newest watch in the Suunto Core line up. It has the updated software 1.0.3. The watch came out Oct of 2008. There was some issues with the earlier production Suunto Cores software. My first impressions are great. This watch was advertised as a Military Core but from my understanding dealers are calling ALL BLACK CORES military? Who knows? The negative display is super crisp and sharp. I bumped up the contrast from the factory setting of 6 to 7 or 8. Just cause I could. It was fine from the factory but why leave well enough alone. I have other ABC Highgear watches (Altiforce with negative display and Altis SS with positive display). I am going to compare the ALL BLACK CORE to the other two. I think this is the most accurate way to see what the Core can do. I first looked the Core over for any manufacturing defects. The bezel turns smooth and isn't lose nor is it tight. I would say the Bezel was perfect. All of the markers aligned up perfectly with the 12 o'clock face. The bezel clicks around with the sound of one of my fly fishing reels and turns both ways. Very nice! The strap has a black buckle. Suunto calls this the all ALL BLACK CORE and I am happy to see it has a black buckle. My impressions of the watch are very cool looking and stealth. It's a looker. The buttons are firm to push and I like the no-slip checkering engraved in them. The Negative display is sharp, perhaps sharper than the Altiforce? The Altiforce has more of a blue cast to the display. Either way both are excellent and I prefer the negative display in the woods. Negative displays also light up better and appear sharper with less light pollution. Speaking of light. The Core's light is great, not too bright and not too dark. I also like that the light has its own button and extends its 5 second time if any other buttons are pushed after you activate the light. 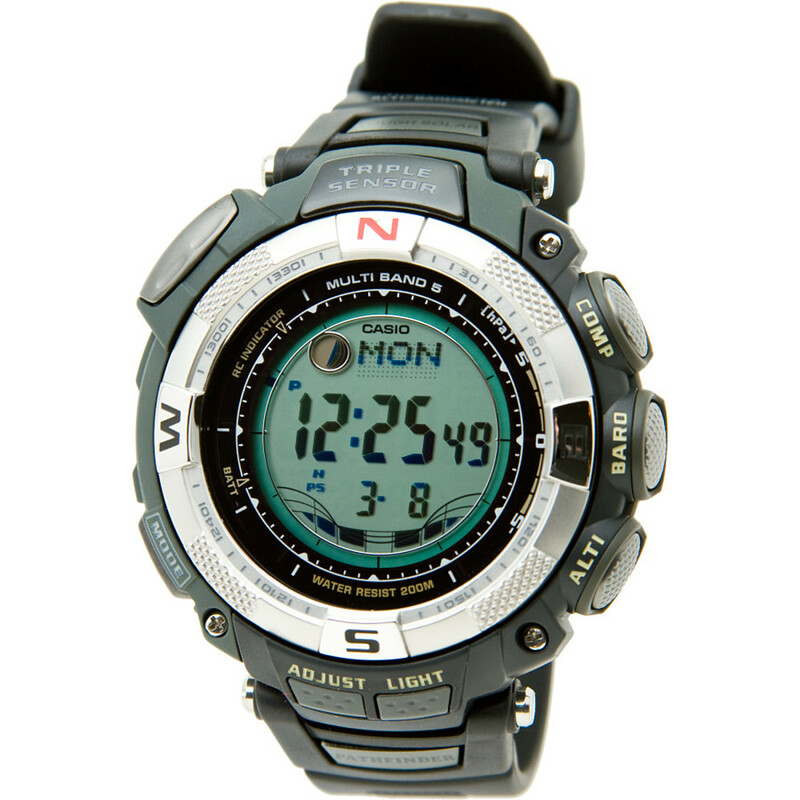 This is especially good when using the compass or navigating the watch at night in the woods. It just makes sense to have the light work this way. I also like the fact that the light blinks when the alarm goes off. A Lot of times in noisy situations (like in a club) you cant hear the alarm but can see the light flash. Brilliant! The alarm is loud and has a quality multi chime sound to it. I am disappointed there isn't a hourly chime. I tested the barometer with both Altiforce and Altis and all three are dead balls on with the reported barometric pressure. This was nice surprise to find that 3 wrist computers are calibrated that accurately. The weather trend indicator was correct by showing the downward direction of both parts of the arrow. It was clear last night and started to rain early this morning. I also tested the altimeter with the other 2 watches and my GPS and it too was dead balls on!!! I especially like the way the Altimeter and Barometer switch to the appropriate profile in the AUTO mode. I tested to see how much movement would switch the barometer profile to the altimeter profile. I let the watch sit and go into the barometer profile. When it did, it made a nice multi chime sound. I then took the Core down one flight of stairs in my house. It didn't switch. So I started to go down my basement stairs and half way down I heard the chime indicating the profile switched back to altimeter. I tested it again and it switched the same spot. Very accurate altimeter!! I then calibrated the compass and tested it with the other two watches. All watches were calibrated the same time. I calibrate my ABC watches by going out side on my deck railing and use a medium Gatorade bottle with the wide mouth. I sit the watch on top of the bottle with the cap on and spin the entire bottle when making the 3 rotations. It keeps the watch perfectly level and is easy to turn slowly. Once again all three watches were dead balls on! At this point I am more than a little impressed. I tested the bearing tracking feature. It worked great and I am excited to try this on Saturday when I go into the woods. I can see this feature is priceless to hunters that are tracking downed game. I can speak from experience that it is very easy to lose your direction while following downed game at night in the woods. This feature can point the way back to the car. Overall I found the watch easy to navigate. Much like my Hi-def receiver with on screen display. You do have to push a few more buttons to get around on the watch but I can see why Suunto uses this format. Its pretty strait forward. My last test so far was to drop the watch in a glass of water for 15 min to make sure it is water tight. It passed. I do this with all my new watches. I want to find out now and not in the field if it goes down. The watch is very comfortable to wear and is thinner than my 2 Highgear watches. I am very impressed so far. I will keep adding to this review as I find more features to talk about. I purchased a Suunto Core watch in Dec 2007. I selected a Suunto because of my past experience with their dive computers. I needed dependability for a one year deployment in Sudan. Total cost was 399 because of additional band and express shipping costs, I was leaving on short notice. After three months I noted that activating the backlight function caused the watch to go blank. This problem solved itself when the watch died altogether two week later. I noted several posts on other review sites indicating battery problems. I emailed Suunto regarding this and asking if the backlight problem was a symptom of the battery problem. They responded that just because the battery died that did not indicate a battery problem. I guess that other than not working the watch is functioning fine in Suunto land. They suggested that I purchase some batteries and if it happened several times then it may be a problem. So now I am in Sudan where I cannot get batteries and can not send it in for repair. I have a 399.00 dollar piece of Chinese garbage that is not heavy enough to use as a paperweight. I have been happy with my dive computers, but the next time I dive I will be wondering if the same quality control was used on them. Bought one here in the Philippines. 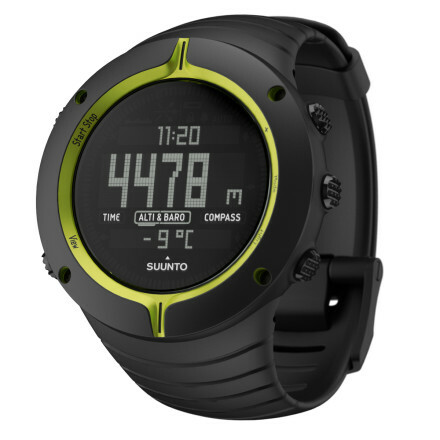 I believe the Suunto VECTOR is better than the CORE in terms of the price and durability. I ordered my Core in November 2006, got it the last day of February. It was nicely packaged and worked great...for a week. It started resetting itself randomly. Every time I looked for the time, it was in the reset mode. I mailed it back to Suunto, who does have a well-oiled (and well used) return mechanism. I had to wait several weeks for a replacement. It arrived in mid-May. However, the compass in THAT watch didn't work, at all. So, I sent it back to Suunto. Now I get to wait until mid-June for a replacement. So, it's been 6 months since I originally ordered it, and still don't have a watch. I expect I'll own a second-generation iPhone before I get a Core that works. They ARE nice, but I wouldn't get one online or by mail order...go into a store and set it up before you leave. If they won't let you do that, buy something else. Bought the Core (black & yellow) a few weeks ago. Bought the Core (black & yellow) a few weeks ago. Was really disappointed, functionality is great and setup is a cinch but the watch is flimsy and feels cheap, and 10 minutes after I put it on my arm it fell off (one of the screws that hold the clasp on was missing...great first impression!!). Thanks, but NO thanks!! An outdoor adventure watch that feels like a piece of lightweight plastic doesn't inspire any confidence, being lightweight is one thing but the Core (black & yellow) feels insignificant. It was my first (had high hopes) Suunto and unless they bring out something a lot more substantial it'll be my last...gave it back to the dealer and got a full refund. Think I'll stick to Polar! Got this watch as a gift and I would not leave home without it. I haven't had any of the said problems previously reported. All features work perfectly. It's even accurate. My only issue with it is the watch is a little thick so it fits tight under some jackets. But overall it is a very nice product. 5 days after purchase the watch shut down. Returned the watch for a replacement. The replacement requires a new battery every 4 days. That's with only using the time feature. Can't imagine what would happen if I were to use the compass, altimeter, storm alarm or other features. Shame. Nice looking watch. Nice box. Received my Core light back around the first of November. Received my Core light back around the first of November. Within a day the sound went out on it. After a call to Suunto USA, they confirmed it to be a bug in the firmware and stated that I needed to remove, wait, and then replace the battery each time this happened to get the sound back. A couple of days later I found that the reference altitude could not be set correctly, after another call to Suunto this was also blamed on the firmware version and I was ask to send the watch back to Suunto USA for replacement. That was over a month ago and Suunto now states that I will not get my warranty replacement until after they have filled all their new holiday orders (next year some time...). That is a crock. Do yourself a favor, buy another watch, or if you must have the Suunto, wait until they work the bugs out. I bought Suunto Core all black at 2009 and than get problem, it always reset every day and than I bought Suunto alu black it also get problem ....now 3rd time I make reclaimed my latter.